Aristolochia clematis is a poisonous (Kingsbury 1964) perennial herb, to 1 m tall, stems ascending or reclining. Leaves alternate, broadly heart-shaped to 10 cm long and wide, tip blunt, base with wide , well separated, rounded lobes, pale below. 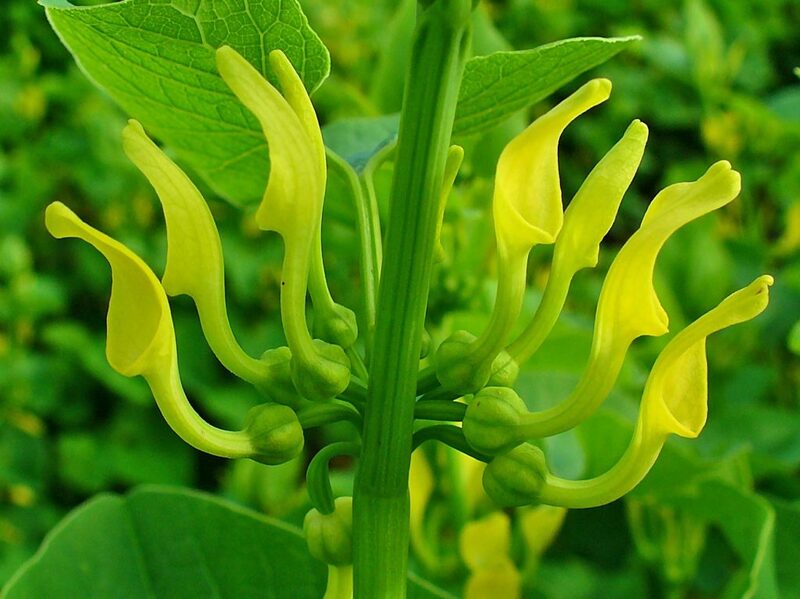 Flowers yellow, no petals, bilaterally symmetrical, calyx tubular, to 3 cm long, base enlarged, top with one lobe. Fruit dry, hollow, a capsule with numerous seeds. Habitat: Very infrequently escaped from cultivation; mistakenly used as a medicinal since Roman times (The Poison Garden website. © John Robertson 2016. thepoisongarden.co.uk) (accessed 10/2016).